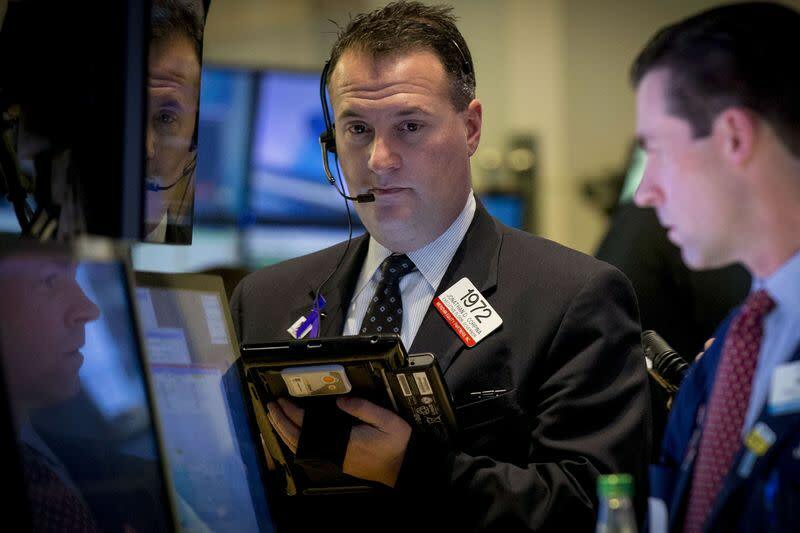 NEW YORK (Reuters) - U.S. stocks fell for a second straight session on Monday, led by another sharp decline in energy shares as oil prices tumbled about 5 percent and concern grew ahead of corporate earnings season. Oil prices extended their recent free-fall after Goldman Sachs slashed its short-term price forecasts and Gulf producers showed no signs of curbing output. The S&P energy index (.SPNY) dropped 2.8 percent, the biggest drag on the S&P 500. Brent (LCOc1) fell 5.3 percent to settle at $47.43 and U.S. crude (CLc1) dropped 4.7 percent to $46.07. "Crude oil is heading down again here. That's sent us into negative territory again. There's a lot of confusion and concern about the impact of oil prices," said Tim Ghriskey, chief investment officer of Solaris Group in Bedford Hills, New York. Profit forecasts for S&P 500 energy companies have dropped sharply in recent months, with fourth-quarter earnings for the sector now expected to have declined 21.1 percent from a year ago, Thomson Reuters data showed. Earnings for all of the S&P 500 are expected to have increased just 3.8 percent over the year-ago period. "What everybody is concerned about is what managements are going to say about crude oil and about global economies," Ghriskey said. The Dow Jones industrial average (.DJI) fell 96.53 points, or 0.54 percent, to 17,640.84, the S&P 500 (.SPX) lost 16.55 points, or 0.81 percent, to 2,028.26 and the Nasdaq Composite (.IXIC) dropped 39.36 points, or 0.84 percent, to 4,664.71. The S&P 500 is down 3 percent since its Dec. 29 record high, pressured by concerns about plunging oil prices, global economic weakness and Greece's potential exit from the euro zone. After the bell, shares of Alcoa (AA.N) rose 1.7 percent to $16.44 following the release of its results. Financials including JPMorgan Chase (JPM.N), Wells Fargo (WFC.N), Goldman Sachs (GS.N) and Citigroup (C.N) are among companies also due to report this week, along with Dow component Intel Corp (INTC.O). Tiffany & Co (TIF.N) shares slumped 14 percent to $89.01 after the upscale jeweler cut its full-year profit forecast, citing a disappointing holiday shopping season. NPS Pharmaceuticals (NPSP.O) shares jumped 8.2 percent to $45.35 and were among the most active on Nasdaq after Shire Plc (SHP.L) agreed to acquire the company for $5.2 billion. U.S.-listed shares of Shire (SHPG.O) slipped 3.9 percent to $209.10. About 6.4 billion shares changed hands on U.S. exchanges, below the 7.3 billion average for the last five sessions, according to BATS Global Markets. NYSE declining issues outnumbered advancers 1,917 to 1,154, for a 1.66-to-1 ratio; on the Nasdaq, 1,701 issues fell and 1,055 advanced, for a 1.61-to-1 ratio favoring decliners. The S&P 500 posted 29 new 52-week highs and 23 new lows; the Nasdaq Composite recorded 75 new highs and 89 new lows.